Kelley is Director of Complete Streets for the City of Philadelphia with ten years of experience focusing on multi-modal transportation. She leads the City’s Vision Zero and Complete Streets efforts. 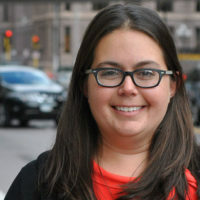 Previously, Kelley was the Pedestrian and Bicycle Coordinator for Hennepin County, MN, and before that a Pedestrian Planner and Project Manager within the Office of Bicycle and Pedestrian Programs at the NYC DOT, and an Urban Designer for A. Nelessen Associates in NJ.